Originally published on 2.23.11 but republished because it’s that important. During Maddy’s homework time yesterday, Owen had one task on his mind: he wanted to write a get-well letter to his buddy who recently had surgery. 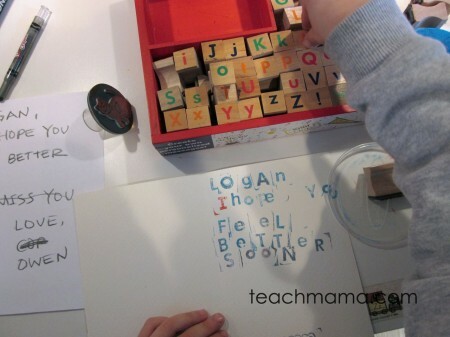 He knew exactly what he wanted to write–he told me at least two times during the day what his letter would say, and we knew exactly what we wanted to put in his pal’s little ‘get well quick’ package. But my O-man wanted to make his letter special. He wanted to make it fancy he said, because he wanted to really cheer his buddy up. 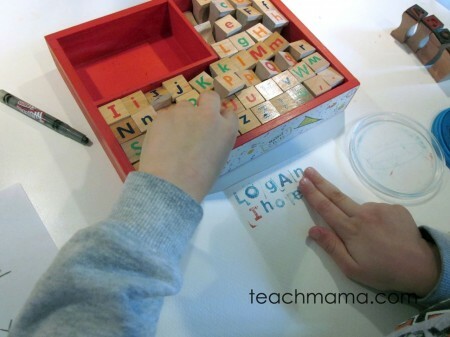 So I brought down the alphabet letter stamps–our favorites from Melissa & Doug–and I asked if he wanted to stamp his letter. Score! 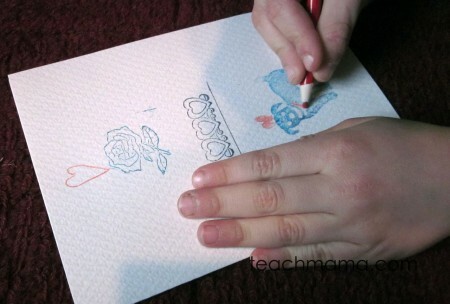 He did, so he got stamping. . .
. . . and while Cora initially began her own letter to Owen’s friend, she quickly switched gears and decided that she instead wanted to ‘stamp names’. So stamping names my little Cora did. All the while, Maddy and I rocked out her homework, and I’ll tell you, overall, homework time went pretty smoothly for us. 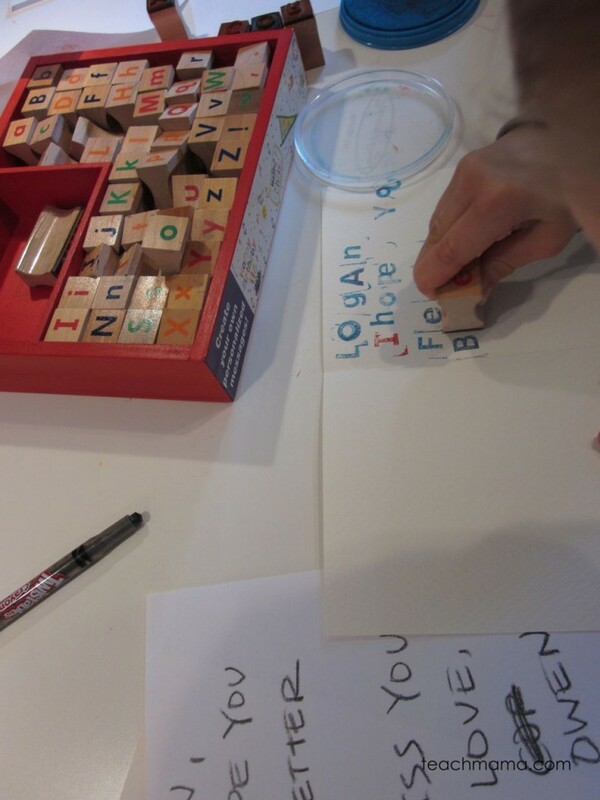 Word Building, Letter Writing, Stamping to Spell: Before Owen began, he dictated his letter to me. I wrote it down and placed it next to his blank card and the alphabet stamps. I asked, Do you want me to make lines for you, Owen? No, I know what to do, he said. And apparently he did. He got rolling and only stopped when Maddy mentioned something to him about spaces between words. You should really try putting two fingers on the paper and use that as the space between words so it’s not all one big word on the page. That’s what my teacher taught me last year. Owen tries out Maddy’s ‘two fingers for a space’ trick. I confirmed her suggestion, and Owen started using his two tiny fingers as spaces. He got hung up when there wasn’t enough room on the page for the ‘u’ in ‘you’ so I tried to squeeze it in for him. It didn’t work: Now it looks like a ‘q’ Mommy. Come on. Really, what am I good for anymore? So I did what I could to fix it and he didn’t ask me for help again. My sweet, sweet Owen was so proud of his letter. And he should be. And I really didn’t need to, because he did know what he was doing. Sure, he moved back and forth between uppercase and lowercase letters, but at this point, that’s no big deal. He used his eyes to follow the words on the letter I wrote, found the correct letter stamp in the set, and then marked that letter on the page. That’s not easy. Sure, he got tired and decided to omit a whole line of his message, but that doesn’t matter. It wasn’t an easy task, and he worked hard. 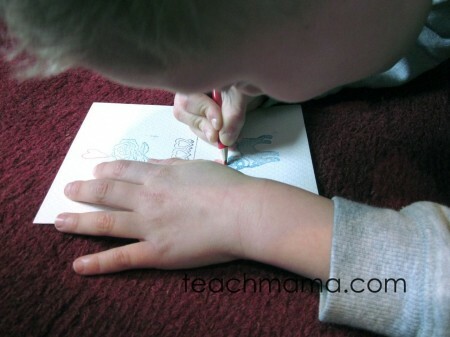 He stamped some flowers, dogs, hearts on the front of the card, and he added his own few hearts for his buddy. If that doesn’t cheer a guy up, I’m not sure what will. 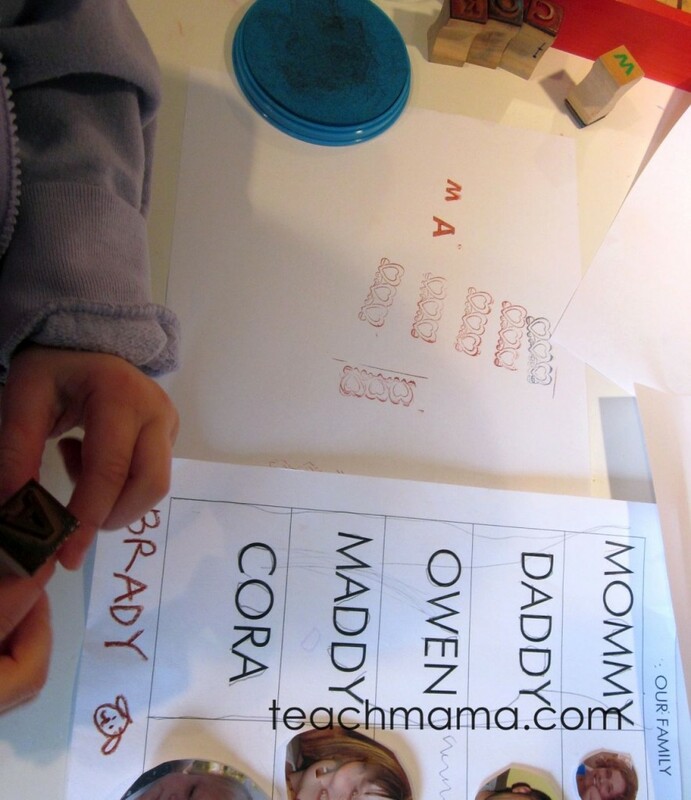 Stamping Family Names: While Owen stamped his letter, Cora stamped our family’s names. The Family Name Charts are here to download if you’d like. They include three charts: one with MOMMY, DADDY and 3 blank spaces; one with Mommy, Daddy, and 3 blank spaces; and one with 5 blank spaces. new family name chart (in Word, so you can change it yourself), or new family chart–BLANK ( as a pdf, so you can write in the names yourself). Enjoy! 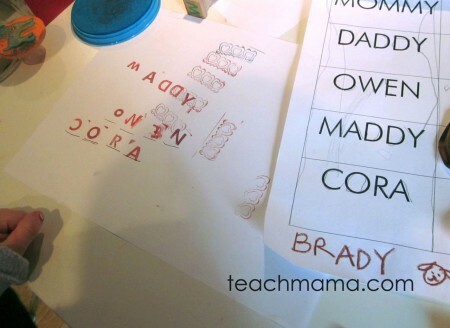 Cora began with Maddy’s name; she said, I need an ‘M’, I need an ‘M‘. And when she found it, she stamped it. Then she’d continue: I need an ‘A’, I need an ‘A’, I need the ‘A’. . . as she searched for it in the box. Once Maddy was stamped, she went on to Owen, but before she started, I drew four little lines for her. You can put the letters right on these lines so each letter is in the right place, I said. I did the same for her name and Brady’s. 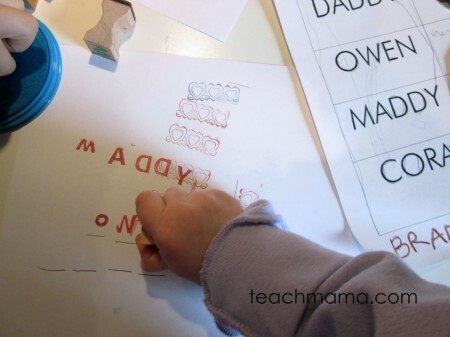 It was hard enough for her to follow the letters from the sheet, to the stamp set, to the paper, and keep them all in the correct spot, so I thought the little lines would give her a little help. And that’s it. Cora stamped out family names, Owen stamped his buddy’s note, and when Maddy was finished with her work, she stamped a few fancy pictures for her pals. 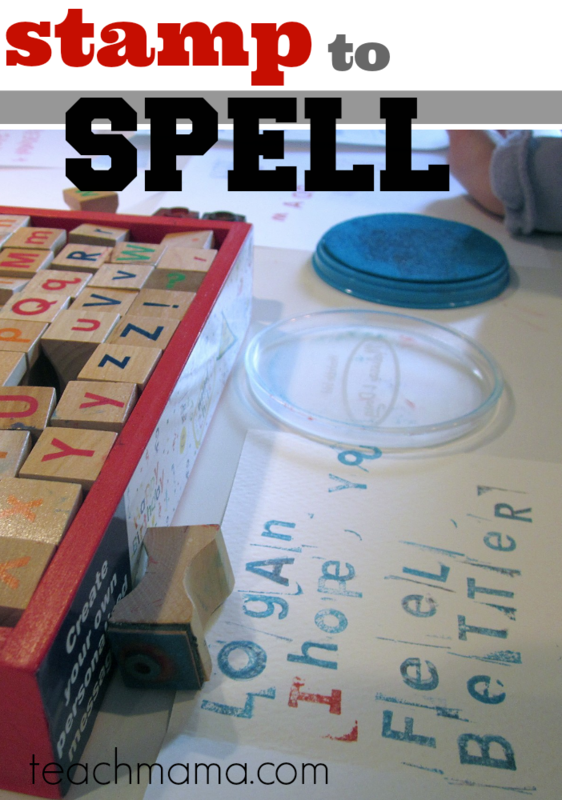 Quick, easy, and worthwhile time spent for everyone, building words, writing letters, and stamping to spell, all the while practicing fine motor skills and spelling. 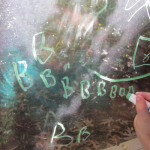 Our kiddos don’t always have to write in order to learn letters and words; in fact, sometimes when we mix things up a bit, they’re even more interested in ‘playing’ and (secretly) learning. What a great idea!! Thanks for the Family Names Chart. 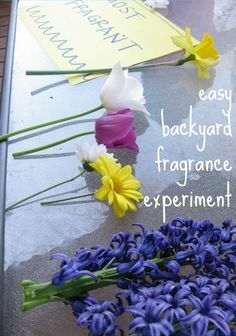 I’m getting ready to make mine now! We’ll have to try making cards too! Stacy–super way to learn those words!! Thanks for linking! We did a family name chart with stickers, inspired by your post. 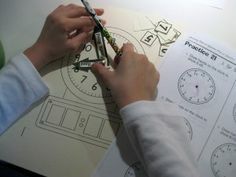 And I’m so excited, I just ordered the Melissa and Doug stamp set from Amazon. I got a gift card randomly and I knew exactly what I’d use it for…diapers and this stamp set that I’ve wanted since I first read this post. Can’t wait to use them with my preschooler who’s just starting to recognize words.